The function of the temperature recorder is becoming more and more intelligent. With the improvement of the automation industry, the development of the recorder has gone through three stages. The development of paper recorders from paper to paperless to wireless transmission has gone through three major stages. Early temperature recorders were all available in paper type with the popularity of computers and the widespread use of temperature recorders that entered the second phase of paperless recorders. The data record of the paperless recorder is more accurate than that of the paper recorder. The data storage is more convenient. The data analysis is also more convenient because of these advantages. The market share of the paperless recorder has increased year by year. The advent of wireless recorders brought the development of temperature recorders into the third phase, which greatly facilitated the download and storage of data. The history of using paper recorders dates back to the early 20th century. It is used to print temperature measurement results on paper for people to understand the temperature measurement results and archive temperature data can be divided into long maps, round maps, punching multiple types. Although there are disadvantages such as small temperature range, small selectable recording interval, low precision, and inability to retain electronic data, paper recorders are not completely replaced by paperless and wireless recorders. Different temperature recorders are suitable for different environments. They are like fans, electric fans, air conditioners. They are not able to replace their role in different environments. The one-time paper recorder is more suitable for the case where the recorder cannot be recycled; in addition, according to the relevant regulations, it is more suitable to use the paper temperature recorder such as electric furnace, heating furnace, environmental monitoring, dairy processing, textile products, drugs in some occasions. It is not a convenient place to take data from a computer such as a preparation product. The advent of paperless recorders has brought the development of temperature recording products to a new field. It uses an electronic storage medium to display temperature measurement results on an LED (Light Emitting Diode Display) or LCD (Liquid Crystal Display) or store the measurement results in a semiconductor chip. After connecting to a computer, the temperature measurement result can be read out by a dedicated program (display, print) Or archived) With large-capacity storage, LCD screen display, flexible settings, high precision, wide temperature zone, etc., it is widely used in cold chain and related industries. In particular, the paperless electronic recorder powered by neon battery. 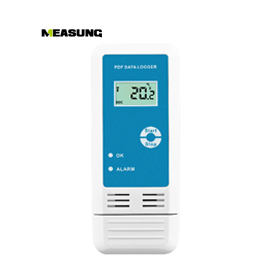 It has become the most widely used temperature recorder product at present, because it does not need external power supply, compact size, self-contained memory chip, power loss and no data loss. 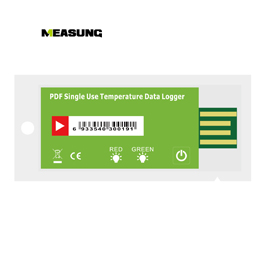 PDF temperature data logger of Xiamen Measung Technology Co.,Ltd Generate PDF reports without any software or drivers. Internal and external probes are optional. These data loggers are ideal for monitoring the temperature of transport, storage and test processes. Press the button to start and stop recording. It is placed in a USB slot on any computer and provides direct access to PDF reports without any software or drivers. 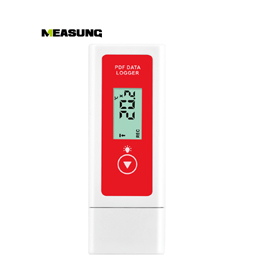 If you want to know the temperature data logger, more related product images, such as temperature recording equipment and USB data loggers, you can contact us directly. We can provide you with more temperature data loggers, related information, or temperature data acquisition systems, or USB data loggers... messages sent to your email address.